Follow this link to access an experimental online version of the Q’eqchi’ ~ English dictionary. This dictionary combines features of both traditional bilingual dictionaries and vocabularies used for language learning. It is a thematic dictionary, since one view of the content is an arrangement of entries by theme, rather than alphabetically. This approach offers advantages to students as a vocabulary builder, to writers as a thesaurus, and to linguists as an insight into the structure and usage of the language. 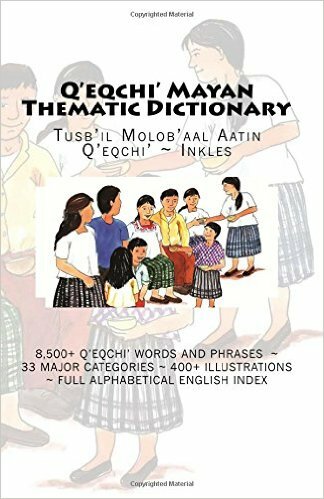 There are also full alphabetical lists of all 8,500 entries in both Q’eqchi’ to English and English to Q’eqchi’. Additionally, there are also supporting pages that include a simple introduction to Q’eqchi’ orthography and pronunciation for English speakers that are new to Q’eqchi’ as well as notes on works consulted in the compilation of the dictionary and definitions of abbreviations used. Feedback is welcome. Work is already underway on an expanded and revised version of the dictionary, perhaps to be published in 2016. Updates on its progress will be published on Mayaglot as they become available. I quite agree with Linda; the Mayan family tree is indeed a godsend. Best of all, you have made it available to all. Thank you. This site is an answer to prayers! … Thank you so much for all of this research. It will help thousands!